Why do my bans/mutes all get reset on server restart? Can i use this on 1.7.9 ? How you fix? And where you find the 2.6 version? All of you use version 2.3. It works and that's before another dude took away. I only had to change the .jar file and I left all of the folder files alone and it works fine. It kept my config that I made. I was using 2.6. My server I develop is running Spigot 1.8.8. 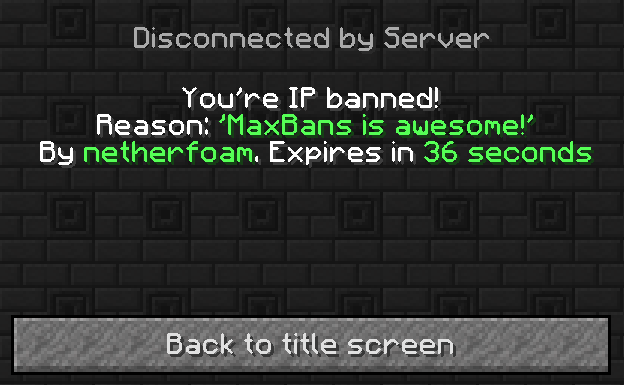 The ban limit thing is bugged or something, saying Ban time it too long! Reducing to ban limit! (1449316466944). So the default 1 week ban is reduced to 10 minutes and 5 seconds. plugin looks good. i hope it will add prefixes to the tables in mysql so it wont mixes up with present tables in the database. ... I am Brasilian my inglish is not very good thanks. /tempban timer limit is always 10 minutes. How can change this? On config file i changed to a large time but has no effect. When you warn a player they do not get sent a message saying they have been warned. Is that an error or is it suppose to be like that? I am most likely not using the current version and my server is 1.7/1.8 . I would like you to add a feature to check the banlist/warnlist/mutelist in-game. I don't want to set up the website. Since when I looked at the tickets 0 had been answered, I'm going to post my problem HERE! Here's my problem: Commands not being executed, no console log of the commands, nothing happens when the warn command is executed besideds a warning broadcast.